The LETSL Instructor can be anybody who is interested in teaching English and does not require an ESL certification. Instructors will be trained in the theory of Story Listening and how to teach English while telling a story. 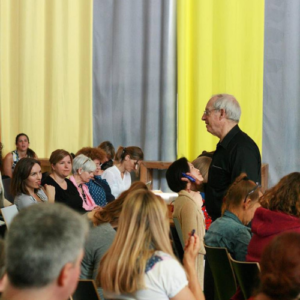 Our fist workshop will be on August 10th, and it will be taught by the researchers and proponents of this theory, Dr. Mason and Dr. Krashen. The Rocky Mountain Welcome Center (RMWC) is an immigrant-led multi-tenant, shared space not-for-profit organization with the mission of fostering intercultural learning, understanding and integration among immigrants, refugees and the Colorado residents through programs and activities that develop supportive multicultural communities.